As I have become better acquainted with Bryston, I have found that this highly regarded Canadian consistently takes their new products to the next level. Well known for durable, great sounding electronics—amplifiers, preamplifiers, and digital players—Bryston entered the highly competitive world of loudspeakers a couple of years ago. Having filled out their Model “T” series of speakers, (Henry Ford, are you listening?) Bryston now debuts the new Model “A” series. 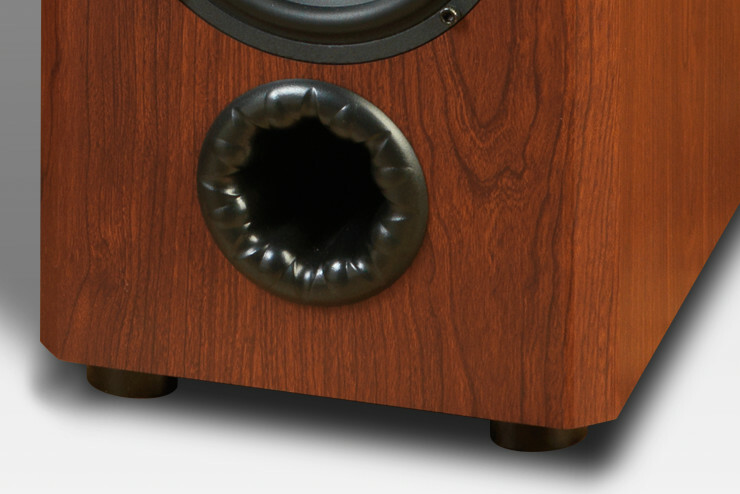 The Model A2 in this review is second from the top of this new speaker line. After removing the two gently tapered columns from their protective cartons, the A2s took pride of place in my listening room. This three-way speaker has pairs of titanium tweeters and aluminum midrange drivers (the same as those used in the more expensive “T” speakers), and two custom-designed 6.5” woofers. Bryston’s James Tanner notes in a company “white” paper that dual drivers confer sonic advantages that include “high sound pressure levels with very low distortion and no dynamic compression.” There are front and rear ports with concave/convex walls and curved edges to reduce friction and port noise. Like most of Bryston’s speakers, the A2 can be bi-wired (the way that I connected them), and driven by amplifiers cranking out anywhere from 10 to 400 watts. Nominal impedance is 4 Ohms. My review sample had a black ash vinyl finish; natural cherry and Boston cherry vinyl are also available. 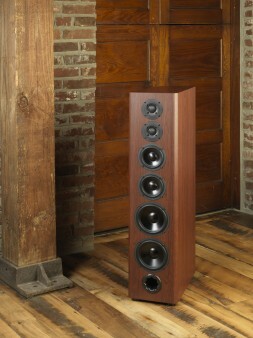 Hardwood cherry, black ash, and rosewood veneers add $200.00 to $500.00 to the cost of each speaker. Removable black grilles are attached with hidden magnets and while they are quite “transparent,” I still preferred listening to the A2s without them. Before placement began, I bolted on the optional black metal outriggers spiked for stability and isolation. The outriggers look nifty and lift the speaker cabinets about two inches off the floor. My Pass INT-60 integrated amplifier, capable of 120 watts into a 4-Ohm load, proved to be a very good match for the A2s. An Oppo BDP-105 provided digital disc playback and my MacBook Air delivered high-resolution files to a PS Audio Perfect Wave II DAC via Audirvana Plus software. Uncertain of how many playing hours the A2s had already received, I went through a 100-hour break-in before serious listening began. Placement is critical for speakers with multiple drivers when near-wall reflections and the so-called “comb filter” effects are taken into consideration. After numerous repositionings (and this is a critical step for best results), the speakers ended up in my 18’ x 12’ listening room as follows: 3’ from the short wall, 8’ apart and aimed straight ahead. My final listening position ended up 11’ away from the center of each speaker. Based on my previous experience with Bryston’s Mini T’s, I was confident that the A2s could handle a wide range of musical selections. Starting with a red book CD, “New Tunes for the Big Bassoon,” a collection of modern works for a contrabassoon (Susan Nigro) and piano (Mark Lindeblad), the A2s elicited, with astonishing clarity, the rich dark tones of the big woodwind and the bright sound palette of the piano. Reference Recordings specializes in discs with huge soundstages and Eiji Oue and his Minnesota Orchestra’s rendition of Rachmaninoff’s Symphonic Dances (176.4kHz/24-bit DVD-R) is an excellent example of their catalog. Thirty seconds into the first dance, a cascade of low strings and ponderous drums gave notice that the A2’s dual woofers were more than capable of handling the tremendous low end of this hi-res recording. “Constantinople” (Modern Cool), opens with the rasp of Michael Arnopol’s bow across his acoustic bass and Patricia Barber’s ethereal vocalise. The A2s gave a stellar account of this demonstration-quality SACD. These speakers also caught the warmth of Jennifer Warnes’ distinctive voice on “Ain’t No Cure for Love,” (Famous Blue Raincoat, 44.1kHz/16-bit FLAC file) and the sultry chest tones of Christy Baron on “Mercy Street” (Retrospective, 96kHz/24-bit FLAC file). A while back I had the unabashed pleasure of reviewing the hi-res (96kHz/24-bit) debut of the first Led Zeppelin albums. Led Zeppelin II breaks out of the gate with “Whole Lotta Love” and boy does it ever rock. The A2s had no trouble delivering the sheer in-your-face exuberance of the Plant-Page-Jones-Bonham quartet at room-shaking volume. There are piano recordings and then there are piano recordings. I have become a great fan of Australian “new age” pianist Fiona Joy, beginning with her recent Signature-Solo 128 DSD download. The complex harmonics, overtones, percussive elements and huge dynamic range of her instrument did not faze these speakers and, as if by magic, a palpably real Steinway grand piano appeared before my very ears. The Bryston A2s managed a bunch of varied selections and convinced me that these speakers are musical chameleons. Whatever your music preferences may be, the A2s can cope with everything that the recording engineers can dish out. A number of audiophiles believe that there is no crossover like no crossover at all. However, well-designed crossovers like those found in these Bryston floor-standers appear to contradict that belief. 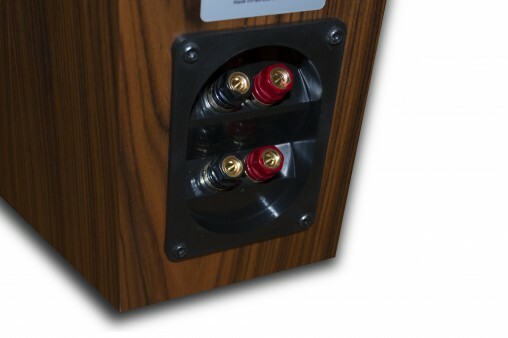 The well-braced A2 cabinets ensure that there are no spurious resonances to color the sound, and the ports effectively kill any extraneous low-end noise. 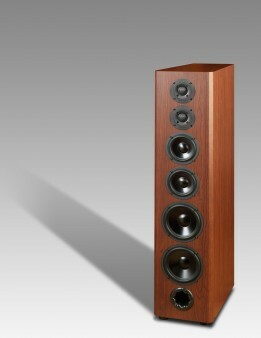 As a bonus, these speakers provide a rather wide listening window, a definite plus for group listening. Finally, their inherent good looks will appeal to the taste buds of even the most demanding interior decorators! When you are contemplating new loudspeakers for your home system, an essential consideration is price versus performance. With the Bryston Model A2s, you will get speakers that, with ears open and eyes closed, sound much bigger and much more expensive than they actually are. Highly recommended.